Two of the biggest challenges facing sales representatives today are time management and having accurate decision making, analysis tools. 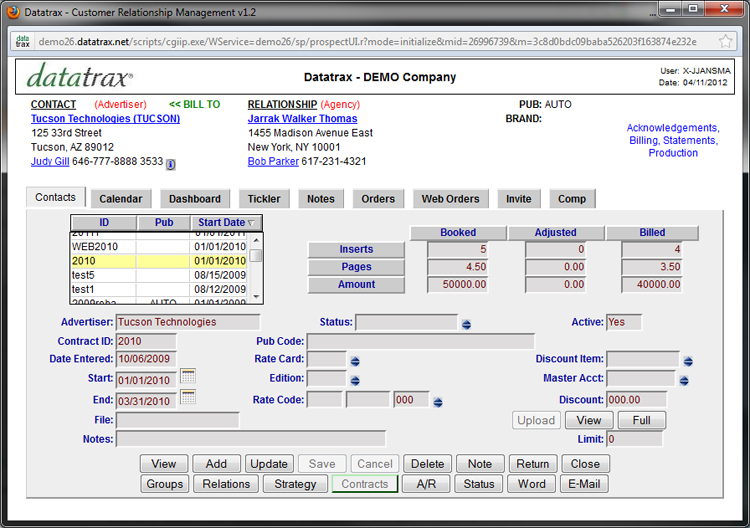 Datatrax® Customer Relationship Management (CRM) is designed to help Sales Departments increase productivity, keep on top of management objectives and create new market strategies by providing access to "real time" transactional data on: Available Inventory, Ad Placement, Position Requests, Sales Forecasts, Advertiser Credit Status, A/R Balances and status of Sales Contract Fulfillments. 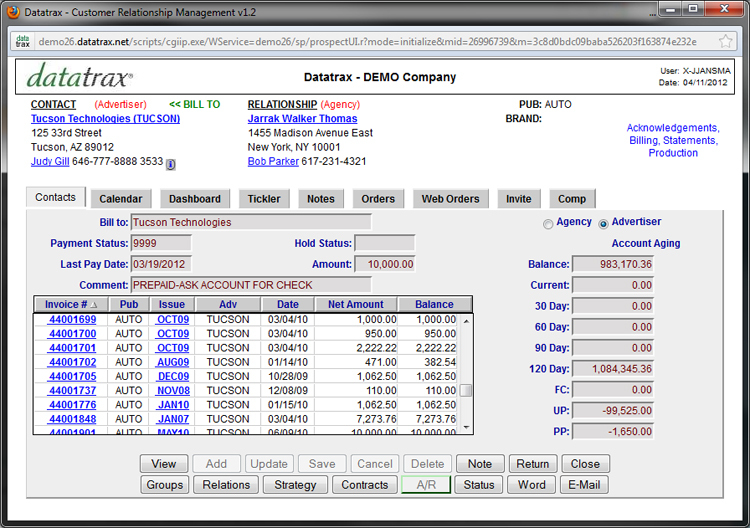 Datatrax® advanced search capabilities and comprehensive features allow for quick access to key sales data including: Sales Prospects, Advertiser / Agency Relationships, Contacts for the Advertiser and Agency, Notes features to record date of last communication, next follow up dates and user-defined strategies for each Contact. Datatrax® provides email links right on the contact screen for a quick and easy way to send PDF Contracts and Acknowledgement forms to Prospects and Advertisers. Integrated, Single Entry Database creates online processes that flow from one department to another: a unified place for everyone to go to: add new sales, update profiles, generate reports and gather information in real time. Tickler, Notes, and Calendar with date, time, action types and text area for writing reminders and notes. Many Advanced Search Features: Full or partial name searches on Account, Individual names, Brand, Product, Contact, PIB code, Advertiser, Agency, Sales Representative, Region, Territory, Current and Billed Orders, Issue, Publication and much more. View and Edit Current Orders: View Account sales history and spot trends. Online Emailable PDF Forms and Send Letters and Documents. Access Documents, Contracts, Past Notes and Correspondence to/from Advertisers & Agencies. Unlimited Classification of Contacts by Groups and Categories and sorting capabilities to target exact market segments; select on Contacts, Advertisers, Agencies, Industry and User-Defined Categories (which can include dollars and/or page criteria) to create promotional lists, direct marketing campaigns and send blast emails. Complimentary Copy Management for Print, Enews and Digital. On line Display of Orders by Status, Credit History and outstanding A/R Balances and drill down to display actual past due invoices. Sales & Marketing Profiles keep your Sales Representatives and Management in sync with current goals, selling strategies and marketing demographics for each active Account. Relationship Management feature for Accounts and Contacts provides a cohesive, correlative view of Contacts, Advertisers, Parent Company and Agencies. User Defined Data Fields to track additional Advertiser demographics – events, materials instructions etc. 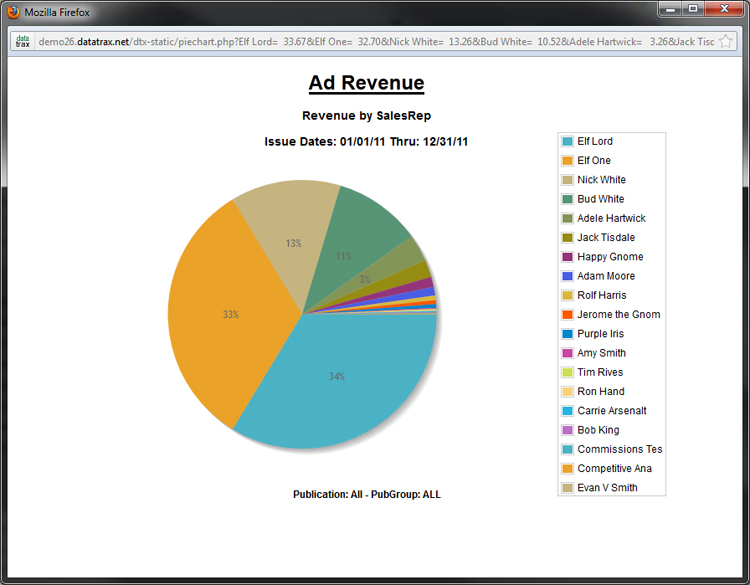 Comprehensive Sales Reporting on Sales Rep Pacing, Pages, Dollars, Date Ranges, Media, Region, Territory. Budget & Forecasting by a range of dates on pages, dollars, by sales representative; page yield analysis. Export all data to other software applications: spreadsheets, layout and imposition programs, report writers. Access Advertiser Payment and Contract/Order History: View A/R Detail, Outstanding Invoices, Credit Status and Payment History, View client communications including: collection notes, emails, scanned documents, collection letters and more; Review Contract Fulfillment status to quickly manage sales opportunities and assist potential clients and Advertisers with possible marketing strategies for their advertising budgets. Access Contact Information: Organize your Contacts into specialized marketing Groups and Categories to create lists for : sales trends, target marketing, blast email campaigns and events planning; Set up Complimentary subscriptions or promotional materials lists; view sales contracts and orders, current A/R invoices - drill down to view actual detail of each order, including: production charges, special discounts, etc); Customize user-defined fields for custom data (e.g. birthdays, family, pets etc); Store contact types under one Account (e.g. Sales Contacts, Production Contacts, Collections Contacts…); System level security features protect Account data from unauthorized access by other areas: business units, users, user groups, companies, etc. Serve Your Clients More Effectively: Schedule and Track Activities with Calendar and Reminder features: call tracking, schedule reminders for departmental meetings, create planning calendars for marketing events. 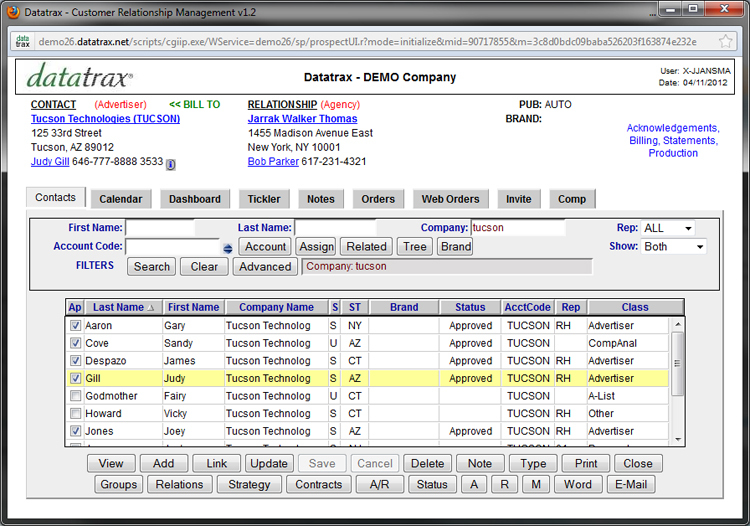 Create Sales Opportunities: Datatrax® helps your Sales team recognize the relationships between Contacts, Advertisers, Parent Companies and Agencies. This correlative hierarchy provides a rich resource for creating opportunities to sell products across media types: print, web, video advertising space, sponsorships, trade shows and more; View Accounts, Contacts, Contracts, Orders and Notes by Classification- A broad vantage point for sales reps to see the client relationship lifecycle (from initial contact, to point of sale, to contract and order placement through order payment and collections); assist with creating trend setting sales strategies and new marketing packages geared towards their client's specific needs; Data Mining- Advanced search features on: Advertisers, Marketing Groups, Contracts, Business Industries, Brand, Region, Territory, Product, Order Classifications, Media Type…. and many more. Your sales team can create specialized lists of Accounts and Contacts for direct mailings and advertising promotions! Track Contract Renewal Dates- Sales Reps can search for their client's contracts by status and determine which Advertisers are at risk for a short rate or which Advertisers have the potential to be offered a rebate if they step up their advertising before the end date of their current contract; Budget and Forecasting Analysis-Sales Reps can spot sales trends for potential new and emerging markets based on reviewing their budget versus actual booked orders for the current year, analyzing the media and product types their Advertisers purchased and developing new sales strategies for the upcoming sales year. Competitive Analysis provides sales reps the opportunity to see where their potential ad space buyer is already advertising - in another competitor's publication or even in another publication owned by your publishing company! Datatrax® has a wide selection of reports with a matrix of user selected sort options available. These comprehensive reports are excellent tools for data mining and analysis. The following is a partial list of some of the standard reports available in Datatrax®. Missing Space Report: Identifies which Advertisers are not running in upcoming issue that may have run in any one of a series of past issues. Contract Fulfillment (Short Rate and Rebate): Provides analysis of which Advertisers are risking a short rate for not meeting their obligations, or which Advertisers can be offered a rebate if they increase their advertising spend before contract expiration date. Advertiser Ranking: Analysis of top Advertisers by pages or dollars for any date range. A/R Ranking: Analysis of Advertisers ranked by most outstanding A/R dollars and aging days. Share of Market: Advertisers who are running advertisements in competitive publications but are not running in our publication; provides opportunity to know that your potential ad space buyer already is buying space in either another publication your publisher sells or in another competitor's publication. Sales Person Analysis: Valuable comparison between pages and dollars booked for a current period to billings/bookings from a previous period (e.g. last issue, last month, last year or any time period. Order Report: Review current order placements with many sorting and sub-totaling options. Can also be used as a sales pacing tool to determine how many placements are ready to run and which placements require action items to be fulfilled or followed-up on. Sales Pacing and Forward Bookings Report: Track potential business through the sales process. View each order by potential close percentage. Track trends and probable close dollars. Advertiser History: Review Advertiser sales and payment history. Budget and Forecast: Analysis of Advertiser estimated sales orders against actual booked orders.